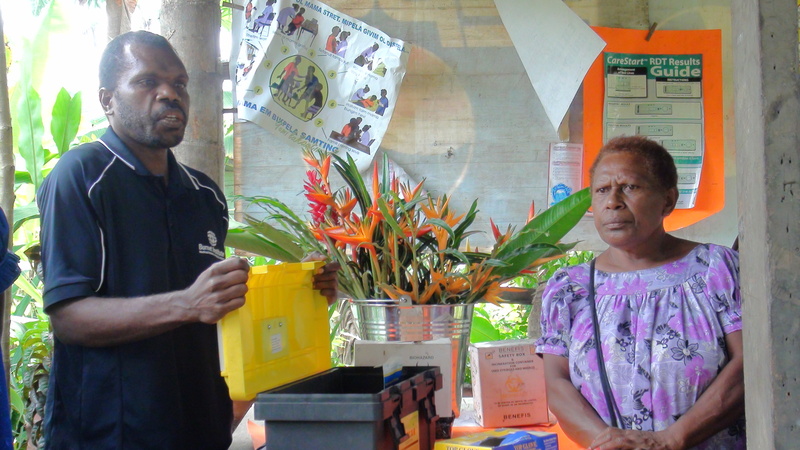 Sakaia Luana is demonstrating the malaria kits to volunteers in a village near Kokopo. Early diagnosis and management of malaria at community level is fundamental to decreasing illnesses and death rates, especially in children less than five years of age. While there is evidence for the effectiveness of home management of malaria (HMM) in Africa, there is little research in malaria prone sites elsewhere. The Burnet HBMM project is helping test this approach in PNG, based on World Health Organization standards (Scaling up Home-based Management of Malaria, WHO, 2004). The project will research the feasibility and best approaches for bringing new rapid diagnostic tests, and modern anti-malarial medicines, to families in rural villages, through training community-based staff, and boosting the capacity of first-line health facilities. Malaria kits ready to be distributed to villages. The overall aim is to reduce severe disease and death from malaria among children younger than age five in target communities, and the purpose of the project is to increase appropriate use of new medicines (ACT) among children younger than age five in target communities. Other objectives are to improve the quality of service provision by community based distributors, and to increase informed demand for health care for children younger than age five suffering from fever. Volunteers practicing their testing techniques under supervision. The project is part of a broader collaboration head by Population Services International. Our key partner is the government Provincial Health Office in East New Britain Province. The project is funded by the Global Fund for AIDS, TB and Malaria (Round 8).